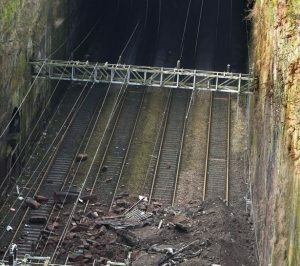 On Tuesday, February 28, 2017, a wall section began to collapse at the top of a cutting above a four-track railway line between the Liverpool Lime Street and Edge Hill stations in Liverpool, England. From approximately 5:30 pm until 6:02 pm, more than 188 tons of debris rained down from the embankment wall collapsing across all four tracks. The Liverpool Lime Street is the city’s main station, one of the busiest in the north of England. With the rubble downing overhead power lines and damage to infrastructure, all mainline services to and from the station were suspended. The collapse brought trains to a standstill for three hours, with a necessary evacuation of three trains. Police, fire, and ambulance crews helped evacuate passengers down the tracks. Two of the trains were halted in tunnels. 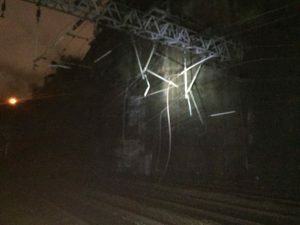 Passengers were stranded on trains at Lime Street station due to power outage resulting from the collapse. A passenger en route to Liverpool from Manchester Oxford Road reported chaos at Warrington station as passengers tried to find their way home. We invite you to use the TapRooT® System to find and fix problems. Attend one of our courses. We offer a basic 2-Day Course and an advanced 5-Day Course. You may also contact us about having a course at your site.